A few years ago I made a Robe à la Française in an informal Toile de Jouy fabric. I based my dress on one from the Kyoto Costume Institute in Japan, and I noticed that one of the pictures showed a slit, an opening, in the side of the skirt. 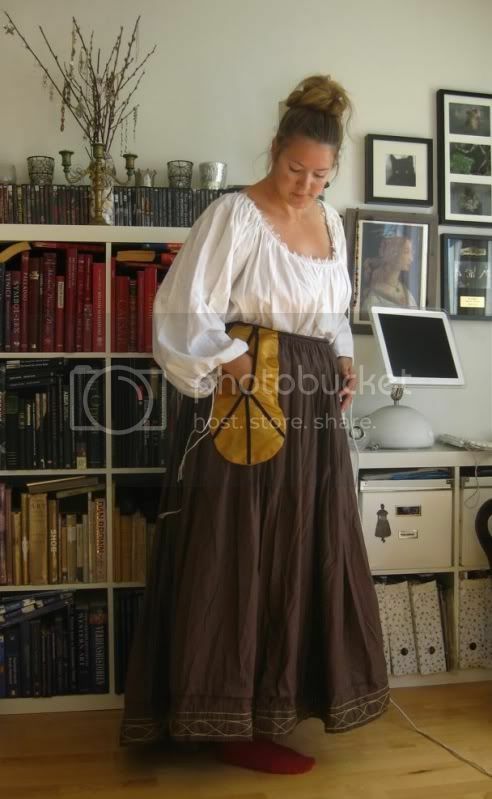 This was my first introduction to the use of pockets underneath historical female dresses. Until some months ago I thought this use of pockets was unique to the 18th century. But then I got the book Moda a Firenze, which shows two examples of Renaissance pockets. And not long after I discovered a roof fresco by Alessandro Allori (1535-1607), made for the maiden quarter of Palazzo Pitti in Florence. The roof fresco is unique because it depicts a domestic, intimate scene rarely seen elsewhere in this period. The main layout is a roof terrasse, with women doing everyday things like washing and combing their hair, mending collars and underclothes, bathing a dog etc. Various linen and undercloth garbs hangs above them, as they had just been washed and is drying in the sun. The women are wearing rather informal attires, though one have pearl earrings and finer clothes. Three of these women have saccoccias hanging over the hip. The two mint green versions seems to be of a mint green fabric with golden embroidery, and they have a slit bound with golden bias tape. The third versions appears to have horizontal stripes and two buttons. The woman combing her hair and the woman braiding her hair (opposite eachother in the fresco) might be the same person - she seems to wear the same outfit, and the hair colour is similar. The book Moda Firenze, which deals with Florentine fashion and how it changed when Eleonora di Toledo imported a continental fashion to the city, also shows saccoccias. Like the roof fresco, two of the illustrations are by Alessandro Allori (as above) and one is by Giovanni Stradano. The first is from ca. 1575-78, and shows a pocket very similar to the roof fresco ones. It's of a mint green fabric, probably silk, and has a golden ornamental pattern. I wonder if it's a gold bullion embroidery. The slit seems to be bound or embroidered in a similar technique. The second is similar in shape, but very different in decorations. It's made of a golden yellow silk or velvet, with black or dark green trimmings. It's attached to an apron string, where the mustard apron with black or dark green stripes also is attached. The same stripy fabric is used for the string. It's made ca. 1595, a bit later than the other ones. The third is an allegorical depiction of women weaving and sewing. The saccoccia depicted is a bit different than the Allori ones. It's made of a white or ivory fabric with gold pattern. Compared to the others it's squarer in shape and the slit is bigger and rounder, but the size seems about the same. Common for these depictions is that they show either working women or women in domestic tasks. This doesn't mean such loose pockets weren't worn with finer outfits - they were hidden under the skirt: "From the side openings of the skirt, corresponding to those of the bodice, it was possible to access the inside pockets, such as that found among the folds of the funeral dress" (of Eleonora di Toledo, my note). These pockets could also be separate items - and mention of such objects is made in the registers of the Guardaroba - tied at the waist, or even sewn to the stays, and left visible only in the costumes of middle and working class women (Landini 2005: 86). Saccoccias are also mentioned in the wardrobe list of a Lisabetta Bonsi: Two cloth pockets with gold lace (Landini 2005: 93). Eleonora di Toledo's funeral dress pocket was made of tafetta, according to Mary W. Bulgarella, who worked on restoring the remains of the burial dress: "Two distinctly cut bits of taffeta were also discovered among the masses of tattered satin. 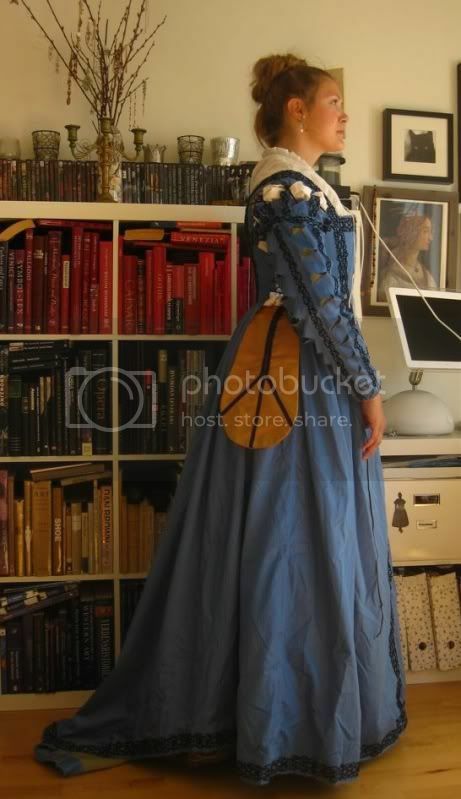 When isolated and flattened out, it was understood that they were portions of an inner pocket, which would have been secured to the waist of the bodice and the skirt" (Bulgarella 2004: 213). That saccoccia appears to have been a bit narrower in shape than the typical oval and square versions usually seen. I also assume they were sewn to either the velvet underbodice or the skirt. Since the corpse of the Duchess was dressed in a hurry, with one stocking inside out and the bodice scarcely laced up in one side, I doubt they would have taken time to tie on a loose pocket. They were practical wear after all, and not something necessary for a burial outfit. There are examples of such loose pockets from Spain too, as seen in the picture above. That version is from the Museo de Traje (Costume Museum) in Madrid, and it's dated to the late 16th century. The shape is comparable to the Florentine equivalents. The decoration is also similar to what is seen in Florentine trims and details, in a technique called ricamo in Italian, and couching in English. The Spanish pocket is described as "scarlet, with gold and silver (threads), with partial opening at top center" (from the museum web site, see link underneath). It has squares with flowers in between, and a tulip motif in the middle. It's referred to as "bolso, "bolsillo" and "faltriquera", looking up the latter will give lots of examples of folk costumes with such decorative loose pockets. I had only seen embroidered pockets from the 18th century previously, so the geometrical Renaissance one fascinated me. The simplicity in shape and trims was highly appealing, and the black/mustard colour combination is striking. In the autumn of 2008 I spent a month in Rome, studying, and after two weeks there I just had to do some needlework. Luckilly/unfortuneately I stumbled across Rome's fabric shop district, between Piazza Venezia and Piazza Argentina. In a tiny, old shop I found a lovely mustard silk, and I bought half a meter. In another shop I bought a black velvet trim, needles and thread. And I ran home to make my first Renaissance saccoccia. I won't attach it to an apron string. I have attached it to a separate drawstring, so it can be worn under the dress skirts of my Florentine dresses. Most of them have side lacing in the bodice, and the skirt has small side splits hidden in the pleats. Wearing a pocket underneath is both comfortable and practical, and I've grown very fond of my mustard saccoccia. The last pictures above shows in in use with my blue Peacock dress. I don't really wear it over the dress skirt, I just pulled it out to show approx. placement of it. It's reached through the skirt slit corresponding with the side lacing of the bodice. I've also made a saccoccia in the technique called ricamo (couching in English). In period items it can be seen in the trims of the crimson Pisa dress, and also in the extant Spanish loose pocket from 1575-1600. It's also what's seen in Eleonora di Toledo's crimson dress in her 1543 portrait, and the pavonazzo outfit in her 1549 portrait. It's basically tucking down a cord on a fabric, in a decorative manner. I used the golden/green brocade I made my Venetian dress of, and tried to follow the pomegranate pattern as far as possible. I also made a waistband and a binding for the opening of the same fabric. The inside is lined with a green/brown fabric.